SEOmoz just updated their site with a new design, as well as some new resources. Here are the best SEO resources offered by SEOmoz without having to be a PRO member. Simply sign up for a free account and take advantage of the following resources. There is nothing more important to someone in SEO and Internet marketing than a strong toolset. Here are the best free tools that SEOmoz has to offer. Free Link Building and Competitive Analysis ToolsFirst, let’s start with free tools for link building research and competitor analysis. 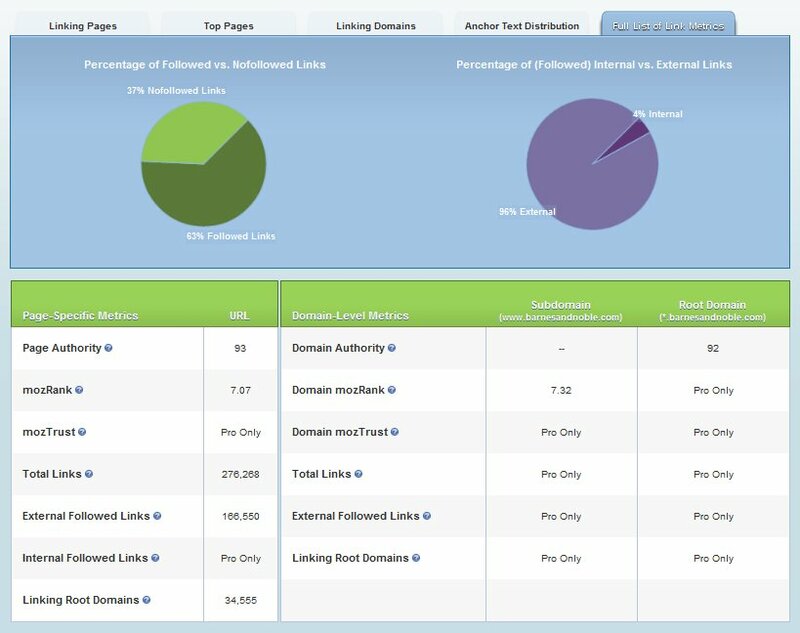 Open Site Explorer allows you to analyze the first 1,000 backlinks of any domain. For the top 20, you can see more advanced metrics, such as the anchor text used to link to the domain and the page / site authority. You can sort the backlinks to show only followed, 301, or nofollowed links, as well as links from all pages, external or internal pages, and links to a specific page, the subdomain, or the entire domain. You will also be able to see the top 20 linked to pages on the domain, the top 20 highest authority domains linking to the queried domain, the top 20 most used anchor text, and other link metrics. You can run an unlimited amount of reports daily. Also available is a comparison report of two URLs so you can see the overall metrics for both as well as the top 20 incoming link domains side to side. The mozBar is a free SEO toolbar for Firefox. It shows you the number of incoming links for the page / domain you are on, as well as offers a toggle for highlighting nofollow links. 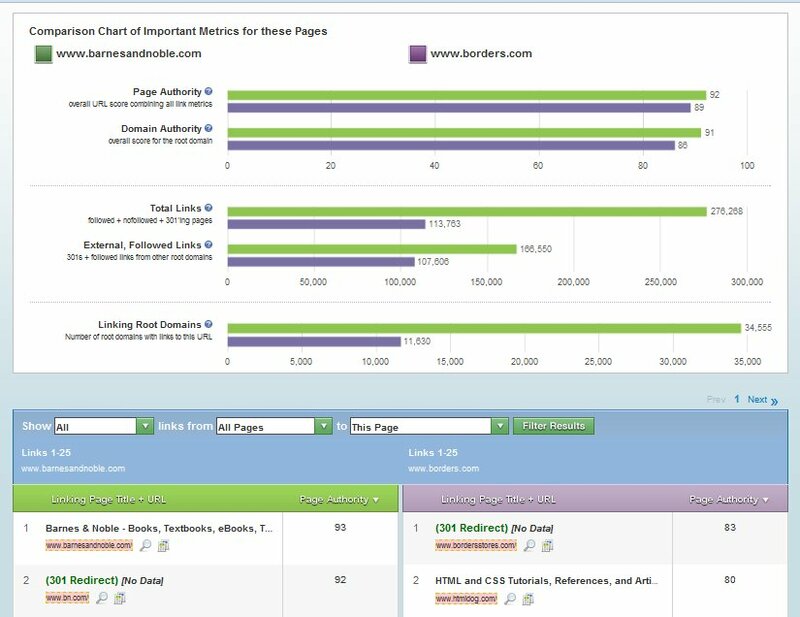 You can also Analyze Page, which shows you various metrics such as total links, page element analysis (title, meta description, and header tags), and page attributes (load time, ip address, and on-page internal and external outgoing links. daily. It looks at data such as the PageRank of the homepage and the top 10 pages on the domain, DMOZ links, Google News mentions, Compete rank, Alexa rank, Yahoo Site Explorer backlinks, and other statistics, each with a link to the original source of information. This tool also provides a list of resources to help you improve your score, based on the areas you need improvement in, such as basic SEO, web design, and traffic generation. Want to know if a domain is getting stronger or weaker? The Historical PageRank Checkershows the PageRank history of a domain going back at least 3 years. The SEOmoz free API allows you to pull a limited number of domain metrics into your applications, with attribution back to SEOmoz. If you’re interested in what it takes to be one of the top sites on the Internet based on domain authority and links, check out the top 500 sites and, even more interesting, the top 500 pages. Although there are more tools for Pro members, they do provide some useful tools for free use. 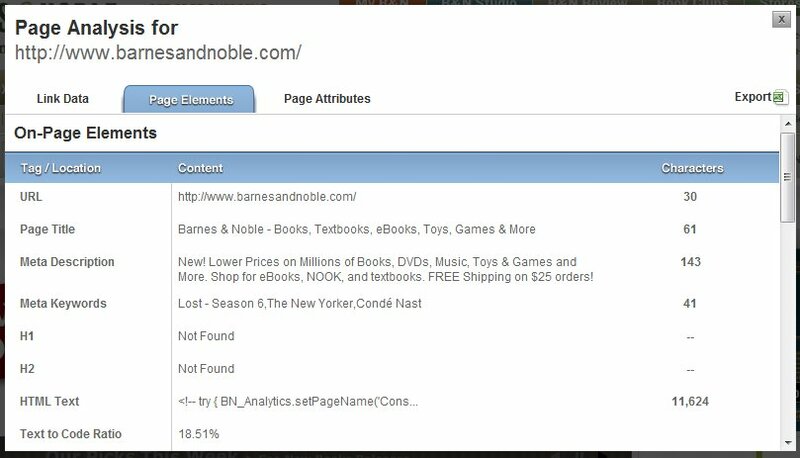 The Term Extractor shows a breakdown of 1 – 3 word terms that a page is focused on, as well as the HTML tags these terms appear in. 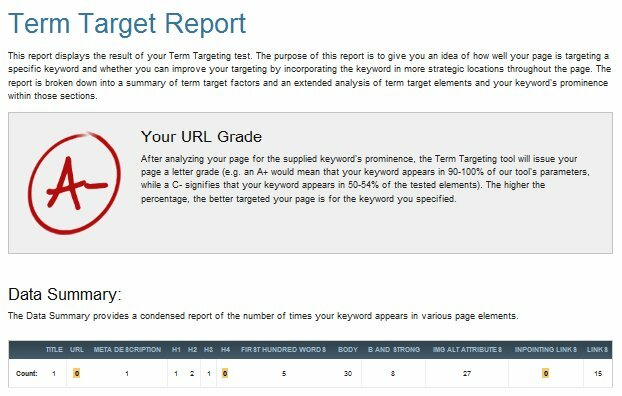 Term Targeting will look at your domain and a specific keyword, and grade your site on it’s keyword optimization. You can run this free report once daily. This report can be used to not only measure your own site’s optimization, but to look at what other sites have done for on-site optimization of a keyword as well. Want to analyze some on-site optimization factors? These tools will help you out. 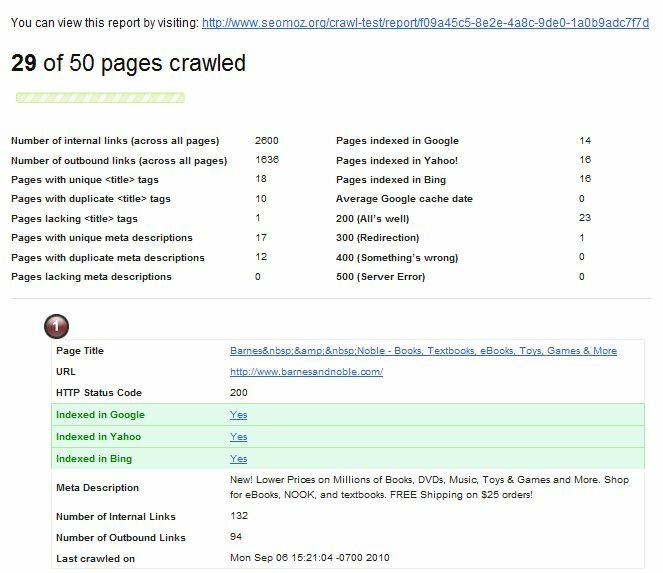 The Crawl Test will analyze the accessibility of your site as seen by search engines, alerting you to any possible problems that would affect caching and rankings. Free members can run this tool once daily. Last but not least are the tools that maybe replaced by newer tools being developed in the labs in the future. But they still have some great information to give in the meantime. Geo Targeting allows you to enter a website, name, and location for a particular business to see if it is locally optimized. It checks to see if the address of the business is located on the site, and also checks local search results from Google, Yahoo, and Bing as well as giving you the link to add your business to local listings if it is not already there. The Popular Searches page shows the current top search terms across a variety of network, including Technorati, Delicious, Flickr, Google, Amazon, eBay, Lycos, Ask, and AOL. Allows you to enter your website, industry, and location, competitor URLs, and keywords to see search queries you can use to acquire new links for particular keywords. http://search.yahoo.com/search?p=keyword+-linkdomain%3Ayourdomain.com&fr=yfp-t-501&toggle=1&cop=mss&ei=UTF-8 for Yahoo Site Explorer. Check the number of Indexed Pages in Google and Bing for a particular domain. Finally, if you want a place to share your experience and expertise when it comes to SEO, feel free to do so at the YOUmoz blogs. These blogs are not only shareable, but are sometimes mentioned on the main SEOmoz Twitter as well as promoted to the main SEOmoz blog itself, based on quality. Thank you for your post. This is excellent information. This is really a helpful post. thank you for sharing those tools are very much important for SEO and website rank. because you need to analysis about your competitors site and search engine 1st page sites. about their backlinks etc.